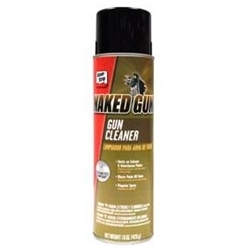 Naked Gun® Gun Cleaner provides a powerful aerosol spray stream that removes both solvent and waterborne paints from hard to reach areas. There is no need for special equipment or time-consuming dipping, thereby reducing cost. Clean spray gun bodies, tips, and cups, as well as many other shop surfaces. To flush out gun, spray directly into the paint inlet or paint cup while pumping the gun trigger. Continue spraying until waste runs clear. To clean outside of gun, hold can approximately 6 - 12 inches from the gun, and apply liberally. Partially cured paint should be allowed to soften for a few minutes before wiping off.